JOIN OUR TEAM ALEX RUNNERS – Have Fun, Get in Shape and Give the Gift of Play! Yes, we are doing it again! 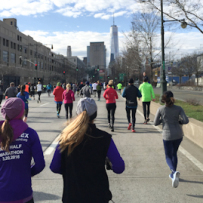 Team Alex is gearing up to run the 2019 United Airlines NYC Half on Sunday, March 17, 2019, on a 13.1 mile tour of New York City. Get in shape while making a difference. Alexandra’s Playground is committed to bringing more children the opportunity for safe, active play. Every year we identify and build playgrounds for very deserving communities in the tri-state NY/NJ/CT area. We also build much needed playgrounds in Haiti. As an official New York Road Runners charity partner, Alexandra’s Playground has a limited number of secured entries for the race. We allocate those spots to team members who do not get entry via the NYRR lottery and who commit to fundraising a minimum of $2000. That fundraising commitment must be met by March 10, 2019. Team Alex has been running the NYC Half Marathon since 2009. Every year our team grows and our fundraising gets stronger. The funds raised go towards giving The Gift of Play by building playgrounds and supporting programs in underserved communities. To date, with a focus on the NY/NJ/CT tri-state area, we have built 26 playgrounds across the US and abroad, and have supported tri-state programs. We promise you will have fun and get in shape while helping to give thousands of children a safe place to play!! Hope to have you on Team Alex 2019!